How to prevent and lessen the chances of contracting salmonella when raising chickens. According to the Centers for Disease Control the best way to prevent contracting salmonella from your backyard flock is to be sure to properly wash your hands with soap and water (use hand sanitizer if soap and water is unavailable) after handling chickens, their feces or touching anything that they use or where they live and be sure to supervise children during hand washing (CDC,2016). Watch our featured video: Salmonella-an overview and introduction. In addition to proper hand washing procedure's there are more ways to prevent contracting salmonella from your chickens. Salmonella poisoning can make you sick and in extreme cases can even cause death. Many chicken keepers are asking us how to prevent getting salmonella from food, eggs, and chickens. We have found many ways to prevent it. How to prevent salmonella using ultra violet lighting, how to identify salmonella in eggs, how to pasteurize eggs to prevent salmonella, how proper handling of baby chicks and eggs can prevent salmonella, recent salmonella statistics, and vaccinating your chickens to prevent salmonella and other diseases. (See Below). Proper handling of baby chicks and eggs can prevent salmonella and the spread of salmonella in your flock. Where to get the latest statics on the spread of salmonella. Signs, symptoms and treatments for various chicken illnesses. 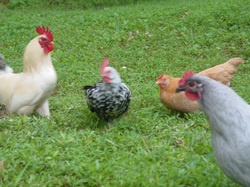 Get the latest news reports about chickens free! Featuring weekly updates ranging from backyard chickens to commercial meat and egg production statistics.